The best blues musicians know it’s all about space — hang back a little and you can let that guitar perform a triple-bypass. 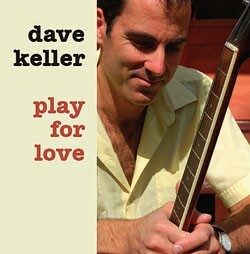 Creating space by knowing when not to play is exactly what makes local bluesman Dave Keller’s new album, Play for Love, so good. Additionally, Keller has the innate ability to allow one unified voice to rise from both his lungs and his Stratocaster. From the moment his vocals first come in, you hear the soul oozing out. I don’t know if he’s Soul Brother Number One in Montpelier, but he’s got to be number two or three, at least. The opener, “Here I Am,” comes in with an echoing and downright pleading guitar riff. It’s truly a beautiful song and demonstrates how a memorable lick can bring a simple blues to a whole different level. That strength continues with the quick groove of “Give It a Rest,” as drummer Brett Hoffman’s ability to lock in a feel becomes clear. For an album composed entirely of live, full-band studio cuts, the beats here are more rock-solid than any Pro-Tools gadget could ever fake. Sadly, there can’t be a solid hook for every song. As the album progresses, many tunes start to sound like you’ve heard them already. The up-tempo numbers definitely grab hold a little better — and thus also draw more attention to the sincerity of Keller’s lyrics. You may be able to dance to “Only Place I’m Going (Is Down),” despite the bummer title. But Keller never lets the listener down throughout the disc. His inspired solos bring life to some of the slower tracks, and at times his riffs sound like a mid-’60s Roger McGuinn. On “Something’s Gotta Give,” a spooky organ line played on the Wurly Electric helps craft a song you might hear on a jukebox in a Tarantino film. What becomes obvious by the end of Play for Love is that six years is too long to wait for such a talented Vermont artist to release a CD. The sound Keller and his bandmates captured in the studio is astonishingly crisp. Check it out in the flesh, as it were, at the CD release party this Saturday at Montpelier’s City Hall.